The Ripieno Choir is a small chamber choir of around thirty singers, directed by Huw Morgan, and based in Esher. We perform a range of sacred and secular music, specialising in the music of Renaissance and Baroque periods. Much of the repertoire is unaccompanied, but when additional forces are called for the choir is able to attract first-class professional soloists and specialist instrumental ensembles. The choir has a reputation for its vocal blend, professional approach, and performances of less well-known pieces. Recent highlights include a series of concerts in 2010/11 featuring the music of Tomas Luis de Victoria (d1611) and a celebration of French Baroque (“La Chapelle Royale, 2014). Read the Early Music Review of this concert. 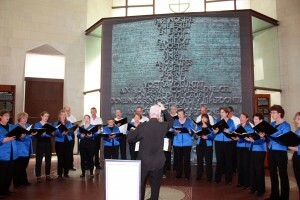 Listen to the choir perform a variety of musical styles. In the Baroque period, the ripieno was the orchestral ensemble in a concerto grosso, in textural opposition to the concertino. In choral music, those singers who were soloists (concertisten) were distinguished from those who supported them (ripienisten). The Ripieno Choir has a long, and proud history. It was founded in 1946 under the choir’s first conductor, John Guillaume. During its early years, the choir won several competitions for unaccompanied choirs, and was invited to take part in BBC broadcasts. During David Hansell’s 22 year tenure as conductor, the choir’s repertoire continued to broaden to include major oratorios (Monteverdi 1610 Vespers, Bach Passions, B minor mass, Christmas Oratorio) for which ensembles of period instruments and leading soloists were engaged, as well music by lesser-known composers. Huw Morgan took over the reigns in September 2018, offering an exciting new future for the choir as we continue to explore our love of the Renaissance & Baroque period, and expand our musical outlook. Versatile and mobile, the Choir has toured in Europe and the USA and visited the Cape in South Africa in October 2007 for a series of charity concerts, raising funds for the St John Home-Based Care project, which trains carers in rural communities to look after the sick and dying unable to afford the medical help they need. The Choir’s most recent tour (2016) took them to Venice and Padua in October last year. Here they were excited to sing music by Monteverdi and Giovanni Croce in the buildings for which it was written and to sing the music of Stravinsky at his graveside on the cemetery island of San Michele.